Most everyone has heard of the trail of Notoriety that Absinthe has left throughout recent history made from Aniseed, Wormwood and Fennel, Absinthe was banned in the early 20th century, but has now made a come back into the mainstream. It is now available for all to sample and possibly join the ranks of famous Absinthe drinkers like Van Gogh, Hemingway and Marilyn Manson to name a few. Recently The Three visited Lee Watson’s latest project ABV along Jupiter Street in Makati. ABV has more than twenty varieties of Absinthe available, served in the traditional way with a Pontarlier Glass (named after the town in France that had the first distillery) an Absinthe Spoon, Sugar Cube and an Absinthe Metal Fountain. Upon Lee’s recommendation I chose a traditional albeit milder version from Francois Guy. 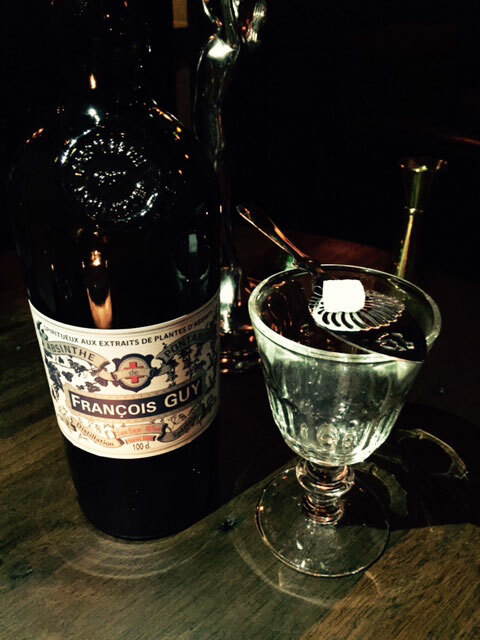 (P330) ABV serves it with 1 part Absinthe poured into the cup. The Absinthe spoon is then placed on the mouth of the cup topped with a sugar cube. Ice cold water (3 parts or to taste) is gently poured out of one of the spigots of the fountain through the sugar creating a milky provenance. The water is supposed to bring out the bouquet and diluting the strong alcohol content while the sugar cuts the underlying bitterness, creating a drink for the ages. Personally, I like it with just a little water and no sugar as I find it too sweet otherwise. But to each his own I guess. One need not worry about the purported hallucinogenic effects as it only happens if your drink copious amounts. Enjoy!